This is easy to use, easy to apply and quick drying (3 minutes a coat). 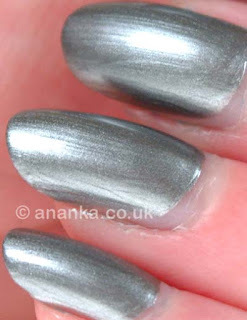 This is a nice metallic silvery pewter. It is quite prone to brushstrokes so be careful with application. I really like it. Lasted well. Also random question... I notice you comment on a lot of nail blogs ananka... What do you use to follow them all? I've been using bloglovin but it keeps making posts "new" again :@ I opened it today and everything up to three weeks old was new again! I use GFC mainly. I use Bloglovin' too. Oh I've not had that issue, I'm not sure about that. Great colour, love the name! heh. É um prata muito bonito..eu gosto sim.